Merlin, Peppe and if you look carefully you might be able to see 12 week old Dutch herder Henry’s little head poking out on the table behind. 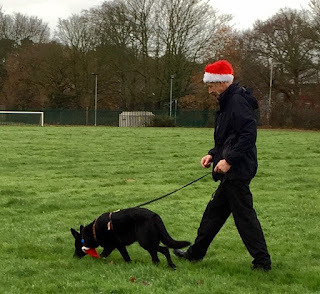 We didn’t do a great deal of training as it was more of a Xmas get together for all our puppy walking teams. All the pups did a track each and some article searching then it was down to the serious business of mince pies for the walkers and liver cake for the pups. Here is Elsa and Steve doing their Xmas track. Here is Chris about to throw a toy into woodland before releasing Peppe to search and locate it. Chris is closely watched by his son Henry who enjoys the sessions as much as Dad. Here is Peppe having located the toy and Chris about to play with him. Note he is worked on a light line to prevent any bad habits developing such as running off with the toy. The toy is a soft canvas dummy which is soft for his mouth while he is still teething. This is a genetic condition which results in dramatic weight loss. She is putting on weight with her medication and she is back to her old self in terms of her incredible drive to work. Here is Lisa hanging on to Eva for all she is worth whilst tracking for her toy. I assumed this condition meant Eva’s Police career was over but our vet states that this is not necessarily the case. We have to wait to see how she progresses on her medication which she will need this for the rest of her life. 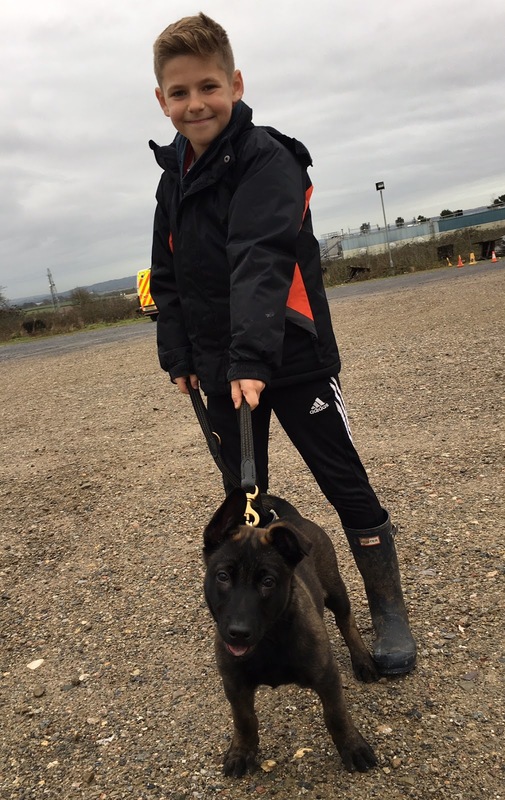 Eva has exceptional natural tracking ability and reminds me very much of Police dog Ash from our A litter who is our current Police dog trials champion. 12 Week old Dutch herder Henry pictured here with walkers Terry and Jill was very much the star of the show. Henry couldn’t resist spending some time with his namesake. Not wishing to upset the Dutch herder purists I think anyone can see from this picture of Henry there are definitely other breeds involved in his makeup. That’s probably why this breed hasn’t got all of the health issues the German Shepherd is currently afflicted with. The only absentees from our get together were Tag, Ollie, Quini and Gunner. Tag and Ollie are no longer with their puppy walkers because they have been allocated to their new handlers to bond and prepare for the 2018 January Initial Police dog course. Quini and Gunner’s puppy walkers had prearranged commitments. 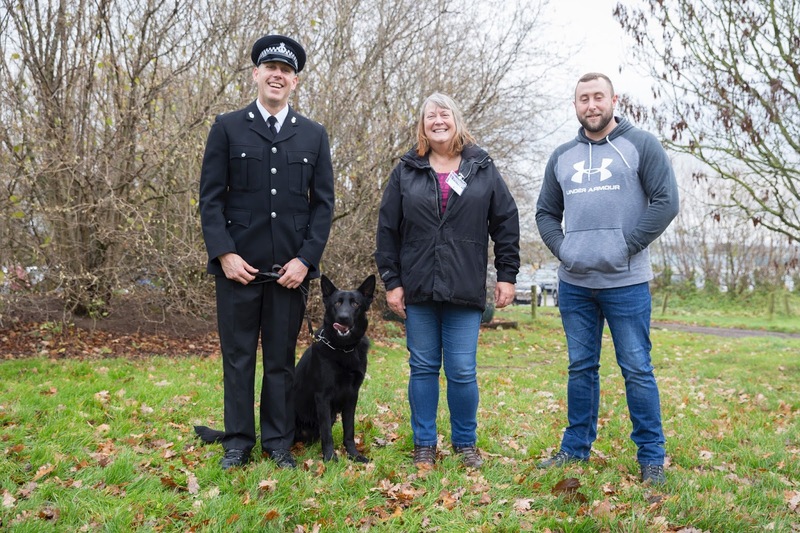 Ollie’s puppy walkers Debbie and Paul are pictured here handing Ollie over to new handler Dan Pencollins. Two days after the handover Ollie’s puppy walker Paul was due to go into hospital for a major operation in Bristol. I am happy to say his operation was a success and Paul is now recuperating. We send Paul and his family our best wishes. Ollie has certainly settled in well with Dan’s family. I think everyone knows my thoughts by now that our German Shepherds should be part of the family. Here is Ollie with Dan’s children Noah and Rose. 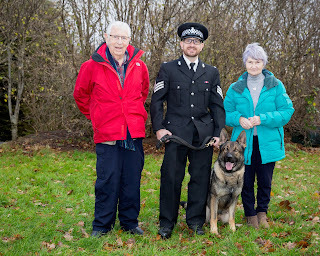 I accept there will always be occasions or situations which prevent the Police dog being part of the family but that should be the exception not the norm. 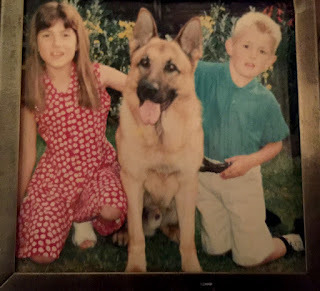 I well remember when I got my first German Shepherd Police dog Harry, he would bite anyone including children if they came into his personal space. With a lot of work and patience he became very much part of the family. Here he is with my children Ashleigh and Josh 26 years ago. I will report on the handlers and dogs on the 2018 January Initial Police dog course in the New Year. The dogs earmarked for the course are Tag, Ollie and Oscar. As reported Tag and Ollie are with their handlers and we await an identified handler for Oscar. Back to the Xmas puppy day. We all had a great day and I would like to thank everyone who helped out and also brought food particularly Mary, Margaret and my wife Diane. The dogs were all well behaved for their photo session. I am really pleased with how all of the pups in our program are progressing and I would like to thank all of our puppy walkers for their hard work and commitment over the last 12 months. From left to right on the day of their passing out parade are PC Kevin Riger with PD Rudy, Course Instructor PC Graham Attwood, PS Kevin Roberts with PD Devon and PC Phil Sim and PD Ozzie. The 11th of September seems a long time ago when the 2017 September General purpose Initial Police dog course commenced under the very excellent instruction of Graham Attwood. After 12 hard weeks the handlers and dogs were assessed over 2 days by Independent assessor PC Andy North a Home office accredited Police dog Instructor from Gwent Police dog section. They were assessed on their ability to track and search for vulnerable missing persons and criminals fleeing the scene of a crime. Here is Kevin and Rudy tracking after a criminal who has left the scene of a crime and later locating him half a mile away. The handlers were assessed on the overall level of control that they have over their dogs. Here they all are being assessed on group control work. They were assessed on their ability to deal with violent and aggressive criminals and disorderly crowds. Here is Ozzie showing he is not worried about a group of disorderly idiots. Rudy is also pictured dealing with a violent crowd and he is quite happy to meet the mob head on. Here is a short video of Kevin and Devon dealing with their violent crowd. In addition to tracking down and searching for offenders or missing persons the dogs are also required to search for any items of discarded or hidden items of property. On the licensing track there are 4 items of property hidden along the half mile track which the dogs must locate. The teams are also required to search for and locate 4 further items of property hidden in a large area. Here is Ozzie indicating to his handler he has found a screwdriver hidden under some leaves. Locating discarded items of property is very important because DNA on the item can link the offender to the item. The dogs are taught to indicate passively without touching the property so as to preserve DNA. Here is Devon dealing with a criminal armed with a weapon and then an attack on his handler Kevin. Kevin then shows the assessor he is able to get Devon to release the criminal on command and return to him. 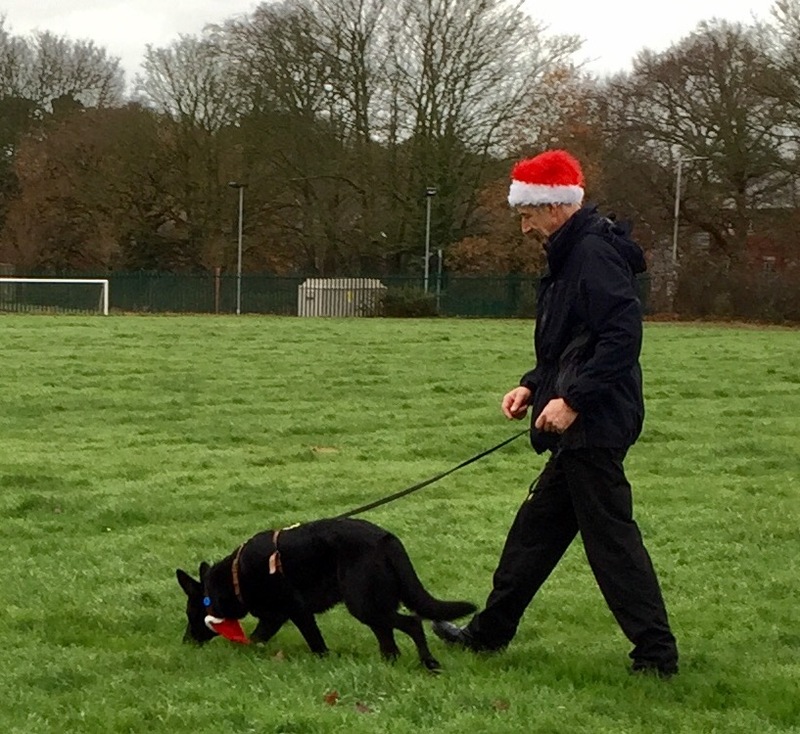 Our assessor watches Ozzie maintaining surveillance on the criminal he has just chased and detained while his handler Phil searches the criminal for evidence or concealed weapons. When dealing with non-compliant criminals Rudy is one of the most determined dogs we have had on an Initial Police dog course for a long time. The gun criminal certainly knows he has been bitten here that’s for sure. The teams are also assessed on their agility in negotiating obstacles. Here is Rudy doing the long jump. Here is Devon doing the scale jump. Here is Ozzie about to be rewarded by Phil for completing the window jump. After 2 days of intensive assessment and scrutiny our assessor Andy awarded all 3 teams their Home office licenses allowing them to be Operational general purpose Police dogs. Andy is pictured second from the left. We thank him for spending the 2 days assessing our dogs. He put all the teams at ease and was very fair in the way he assessed the teams. So that left one day to prepare for the passing out parade on the Thursday. We have traditionally held a passing out parade for all of our Operational Police dog teams for over 30 years now. 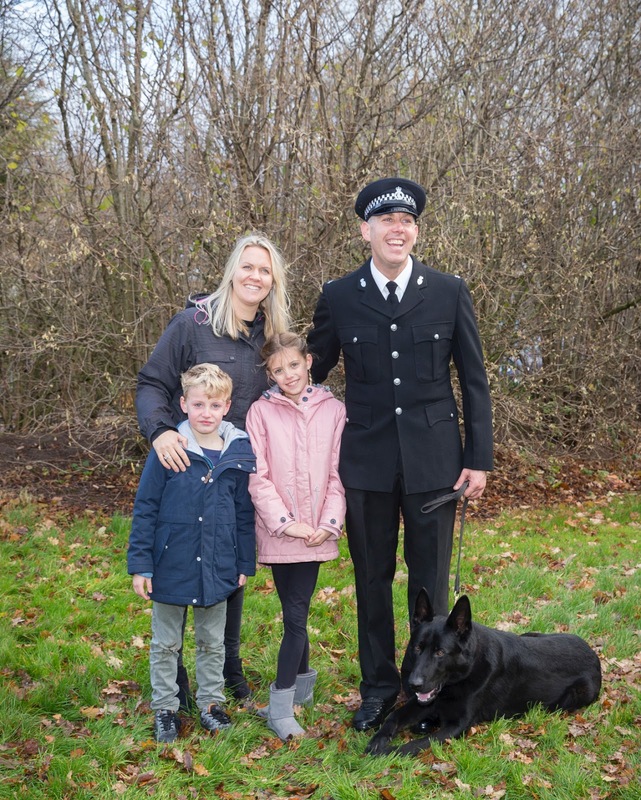 It gives us the chance to say thank you to all of our puppy walkers and also for the handlers to share the day with their family and friends. We start with photographs of all the puppy walkers and handlers families with their dogs before putting on a short display of the skills acquired through the course. 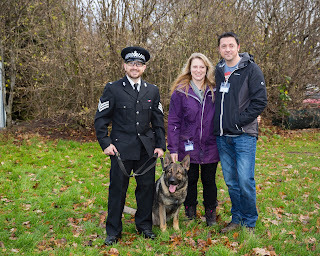 Here are puppy walkers Lindsay and Anthony Lane-lobb who puppy walked Devon with handler Kevin. They have previously puppy walked Buddy from our B litter and Cosmic from our C litter. Here is Kevin and Devon with his family. 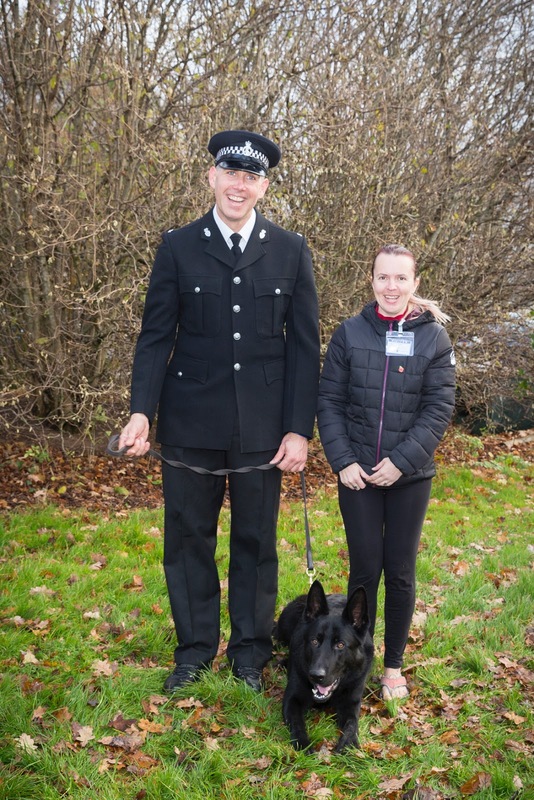 Devon is Kevin’s first dog and he is the Dog section supervisor for Ashburton and Plymouth dog centres. Here is Ozzie with his first puppy walker Marie Broom. Marie and husband Wayne looked after Ozzie for several months but it soon became obvious that his very strong will required a very experienced puppy walker. Ozzie. He is a dog who needs calm patient but firm handling because he is a dog who will exploit any weaknesses in his handlers control over him. Ozzie was then puppy walked by our most experienced puppy walker Lyn Parlour pictured here with her son Ian and Ozzie. You can see the obvious joy in Ozzie being reunited with Lyn and Ian. I can tell you he reacted in exactly the same way on meeting Marie which shows they never forget. Here is Ozzie with Phil and his family. 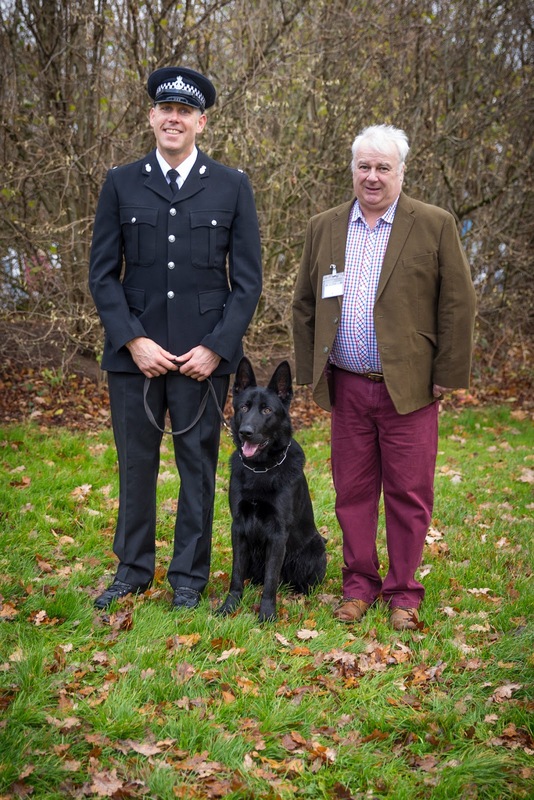 Also pictured here is my friend and breeder Richard Evans who bred Ozzie and his litter brothers Ollie and Oscar who will be on our January 2018 Initial Police dog course. Ozzie and Phil will be stationed together at Plymouth dog unit. Last but not least is Rudy. I puppy walked Rudy having brought him from Holland as a puppy. I purchased him as my own dog but because our D litter didn’t produce enough potential Police dogs and we were short of a dog for the course I let Rudy go to the course. 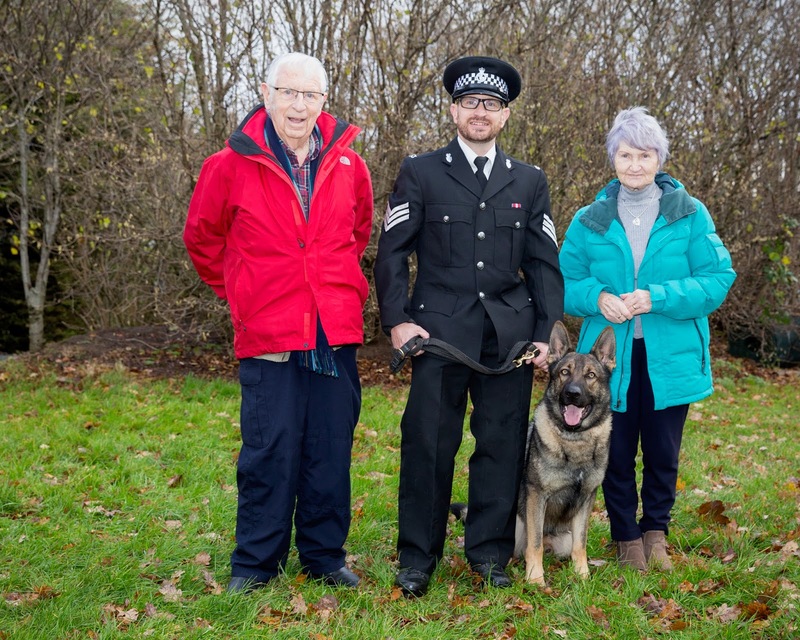 Here he is with his new handler Kevin Riger and his family. Kevin and Rudy will be stationed at Bodmin dog unit. After the photographs the teams put on a short display of control and focus work. Rudy dealing with a criminal armed with a gun. Here is Devon dealing with a criminal armed with a stick. Here is Ozzie dealing with a fleeing criminal. Home Office certificates and the puppy walkers were presented with a photograph of the pup that they had puppy walked. A photo was also presented to Richard Evans the breeder of Ozzie. 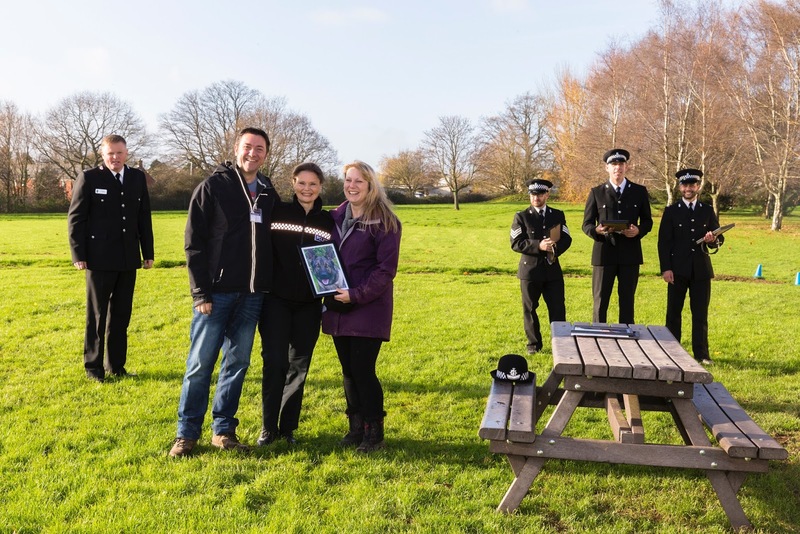 Here are puppy walkers Lindsay and Anthony being presented with a photo of Devon from our D litter. On behalf of the course I would like to thank Supt Leaper for presenting the certificates and photo’s. I have been obtaining all of our pups for over 20 years now and I still find the passing out parades very emotional. I think of the walkers whose pups didn’t make it to this stage and I think of all the training and development sessions that have taken place with our puppy walkers. We become one big family and seeing our puppy walkers with their tiny pups growing into Police dogs is an incredible experience. My thanks once again go out to our wonderful puppy walkers whether their pups make it as Police dogs or not. Without them we wouldn’t have the excellent dogs that we have. Puppy walker Lyn and Ian who puppy walked Ozzie are now walking Merlin who just like Ozzie is going to be a very strong character. They brought him along to sample the atmosphere and he seemed to enjoy the day. I am continuing working with Danno who we released from the Initial course. He is enjoying life with me and Ella. I will decide in the New year where his future lies but at this stage I am enjoying having him and we will see where the work I am doing with him takes us. 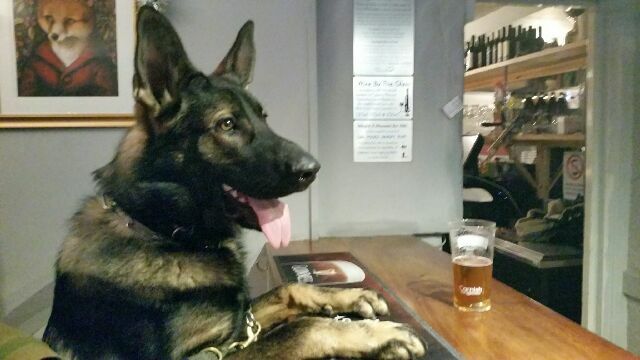 I will leave the last word to Police pup Eric enjoying a pint of Tribute at his local to wish you all a Merry Xmas and a happy new year. who had been bred by Ian Morgan of Lorockmor working dogs. I was so impressed by Merlin that I visited Ian’s kennels to see his dogs and his set up. He is an experienced breeder of German Shepherds, Belgian shepherds ( Malinois ) and Dutch shepherds ( Herders ). He showed me his latest litter of very impressive Dutch herder pups who were 6 weeks old. I returned the following week and assessed the litter and selected Henry for our puppy program. Before anyone starts to panic I am not abandoning the German shepherd as I still believe that the German shepherd is the best breed for our needs particularly with regard to operational tracking. But having said that the German shepherd has numerous inherited health issues and in the last 2 years we have experienced quite a significant number of our pups having to be retired prematurely with many of these issues. The Dutch herder is a very athletic, robust dog with excellent working attributes and does not seem to suffer with any health issues. This is Ian’s working female. 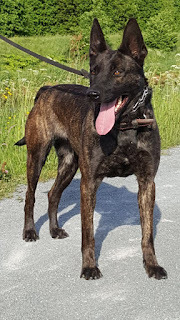 In force we have 4 operational German shepherd/ Malinois crossbred dogs who were acquired from breeder Drew Rush. 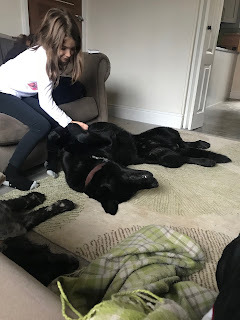 They are all doing very well operationally and so I intend to experiment with further cross breed combinations to try and reduce the health problems we have been having with the German shepherd. Henry is being puppy walked by Terry and Jill Hodge who have puppy walked over 12 pups for us over the last 20 years. Here are some photos and a couple of videos of Henry in the first couple days with Terry and Jill. Henry is earmarked for our January 2019 Initial Police dog course and I am hopeful that Ian will provide several more German shepherd pups and a Herder/ Malinois cross to join Henry on that course. Last weekend I held a training session at HQ Middlemoor which was attended by Eric, Gunner, Eva and Elsa. We concentrated on tracking, article searching, ensuring the pups release their toy or possession when requested, prevention of the pup jumping up, and person searching in a building. Eric is now 9 months old and is developing into a very nice dog. He has a lovely easy going biddable nature and just loves life. He has settled in really well with Eamon, Karen and the family. Eamon is pictured here getting ready to throw Eric’s toy into rough terrain. Eric searches and easily locates his toy. Elsa is Eric’s sister and she has a very strong work ethic. She is a very driven powerful dog but very relaxed and easy to live with at home. Her puppy walker Steve was away for this weekend and so Mary who is looking after her kindly brought her to the class. She is a bit too powerful for Mary to work and so retired dog Sergeant Alan Knight who came with his daughter Maddie handled her for me. You can see the incredible focus and desire she has for her toy but the lovely clear head she has as she waits patiently for permission to replay. Here is Steve working the agility ramps on our previous session. Here are Eric and Elsa pictured with their puppy walkers at the same session. Gunner is now aged 8 months and is pictured here with puppy walker Mark demonstrating how to get Gunner to give up his toy when requested. It is very important that a puppy always releases whatever he/she is holding on request. As I reported in my last blog Gunners brother has had to retire with hip dysplacia. We have had Gunner x rayed as a precaution and thankfully his hips are very good. Eva is pictured here tracking with puppy walker Billy and it’s no exaggeration to say that Eva has natural tracking ability and is outstanding in this area of work. Eva’s training and development has been progressing really well but recently Eva began losing weight dropping from 26 to 21 kilo’s. She has been diagnosed with Pancreatic Enzyme deficiency which will require her to be on medication for the rest of her life. Lisa has been nursing her back to health and we are quietly optimistic that she will make a full recovery. Her Police career still hangs in the balance but such is her exceptional tracking ability that we all have our fingers crossed she can still make it. This Sunday I held a training session in Plymouth for Quini and Merlin before going on to Exeter for a training session with Quest ( Quini’s brother ) and Peppe. Little 9 week old Henry also made a short appearance. We concentrated on the same exercises and disciplines we had covered the previous week. Merlin is now 4 months old and like so many of the pups in this group is a very determined larger than life character. He is pictured here with puppy walker Lyn. He was very possessive about his toys when Lyn started with him and there was no way that Lyn could use the hoover or hose without full on attacks from Merlin. With time he is learning the house rules. By directing his drives he is learning it is in his interests to release his toy and control himself to regain the toy again. His tracking is coming along very nicely. Quini is now 5 months old and is being puppy walked on a temporary basis by Terri Boswell and her family until the New Year when she will be returning to me. That is subject to me first having found a good home for Danno. Here she is Quini with the family Terri, Mark and Tristen. Quini is a real handful and does everything at 100 mph. She is very determined and therefore control exercises have been introduced early. Terri is pictured here working on stopping Quini jumping up for her toy after she has released it. She is giving up her toy nicely but Terri stands on the line so that if Quini does jump up she will correct herself. Quest pictured here with puppy walkers Mitzi and Colin is a slightly larger version of his sister Quini but he is no less driven and determined. Quest and Quini were purchased in Belgium and I am really pleased with their progress and very exciting potential. Quest is pictured here doing a very fast recall to Mitzi. 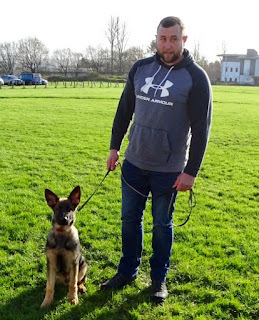 Quest is pictured here already showing a nice solid down stay for puppy walker Colin. After a tentative and cautious start Peppe is now becoming much more confident and outgoing. 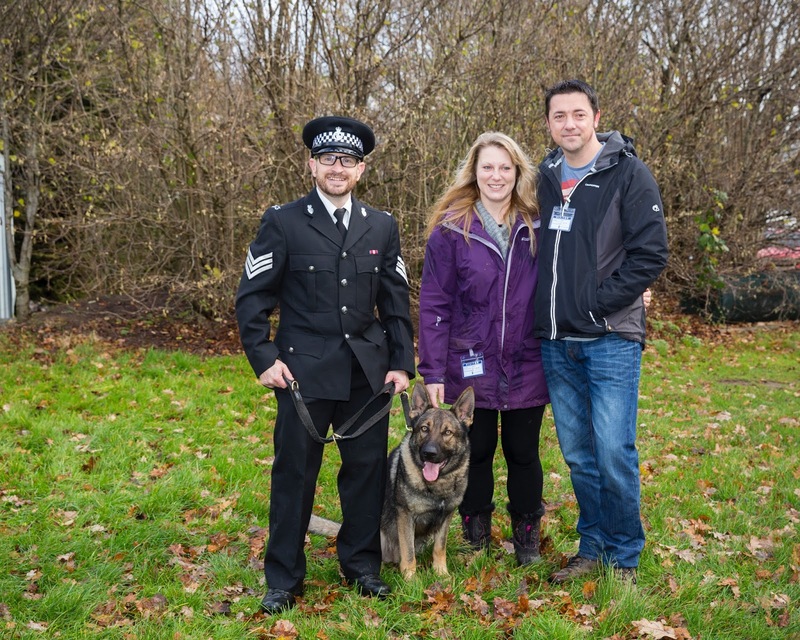 Here he is pictured with puppy walkers Chris and Lyndsey. I have been very impressed with Chris’s handling style and the obvious pride he has in Peppe. In such a short time Peppe has developed an obvious trust in Chris which is why he is making such progress. Chris and Peppe are pictured here playing search games and just working on releasing his toy. Peppe is pictured here recalling to Lyndsey. Peppe looks to be improving with his travel sickness. On our last session Peppe wasn’t so confident on the ramps and tunnel and so Chris built his own little agility course at home. It was really impressive to see the difference on the agility course on Sunday as a result of Chris’s work. Henry may be only 9 weeks but he seemed quite at home with all the hustle and bustle of our training day. Here he is practising a sit with Jill. Next he had a go in the tunnel. Finally a short introduction to tracking. 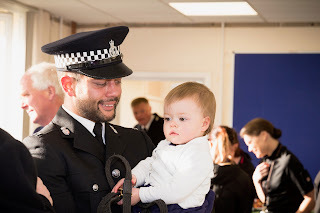 Although Henry has only had the first of his two inoculations we believe providing we are sensible the benefits of this early socialisation outweighs the risks. Well the day I had been dreading finally arrived when Tag had to go to his new handler for the January Initial Police dog course. We all knew that Marina was going to be upset but Gideon tells me that it hit Mum Jo more than anyone. Tag is pictured here with puppy walker Gideon being handed to his new handler Steve Newton from Dorset dog section. 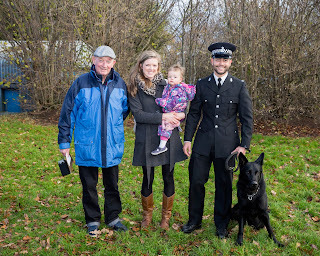 Steve had already looked after Tag on a couple of occasions when the family had been on short breaks and Steve used to work with Gideon in Dorset Police. Steve will be making sure regular contact is maintained. Oscar (centre) and Ollie ( right ) are pictured here on a visit to the 2017 September Initial Police dog course to see their brother Ozzie. 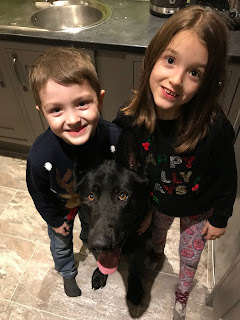 Ozzie should have been on the January 2018 course with his brothers but because we were a dog short for the September 2017 course Ozzie was fast tracked onto that course. At the time of writing this blog Ozzie has successfully been assessed and licensed with Rudy and Devon as operational Police dogs. will continue with regular training while they wait for handlers to be identified to join Steve and Tag on the January 2018 course. Danno completed 5 weeks on the September 2017 Initial Police dog course but was released due to a lack of determination on some of the exercises. He spent some time with me until I found what appeared to be a suitable home for him in Maidstone, Kent. Unfortunately that didn’t work out and so he is back with me and Ella. He loves Ella and there is no doubt having her around has rebuilt his confidence which was definitely very low when he came back to me. There is no doubt lots of play with Ella has made a huge difference to him. Here they are together in the bushes. He may be 18 months now but there is no doubt 9 month old Ella is the governor. Danno is a very sweet natured dog in and around people he knows but can be defensive if strangers get to close to him. I intend to work on this issue now that I have his confidence and trust. I am hopeful that I will find him a home in the New Year. Well thats an update on all of the pups and next week I will do a final blog of 2017 of the Initial course final assessments and passing out parade. Bye for now from me, Ella and Danno.